When dogs wind up in shelters, sometimes the only love they get comes from each other. 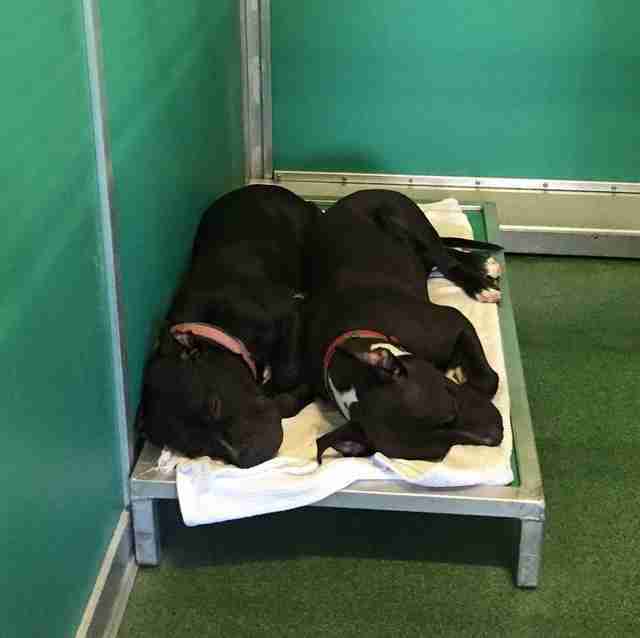 That may be true for Sugarfoot and Kaite, two black pitties who wound up sharing a kennel at the Palm Beach County Animal Care and Control shelter in Florida. Shelter volunteer Erin Ryan shared this photo of the two of them online, saying "I LOVE the dogs in our shelter so much and want nothing more than for others to see how amazing they are and save their life." Sugarfoot was surrendered to the shelter back in August after her family moved from a house to an apartment and couldn't keep her, a shelter spokesperson told The Dodo. Shelter staff describe her as "high energy, friendly, good with people and kids." Kaite came in a couple weeks later, in early September, after being picked up as a stray. The two are paired in a kennel together, which is standard practice for Palm Beach ACC - but it's clear they've become fast friends. Sadly, the deck is stacked against Kaite and Sugarfoot. Pit bulls face discrimination that makes it much harder for them to find homes - Some estimates suggest that 2,800 pit bulls are euthanized each day. All Sugarfoot and Kaite need is someone who is willing to give them a chance to be the happy, loving pets they can be. Maybe, against all odds, they'll find homes. Preferably together, so they can keep snuggling. For adoption info, visit the Palm Beach ACC website here.